The Center for Data Innovation spoke with Hanchuan Peng, group leader at the Allen Institute for Brain Science in Seattle, Washington. Peng discussed the ongoing BigNeuron project and the potential it has to provide valuable data to the neurological community. Joshua New: The goal of the BigNeuron project is to perfect and standardize the three-dimensional reconstruction of individual neurons. Why is this important for the field neuroscience? 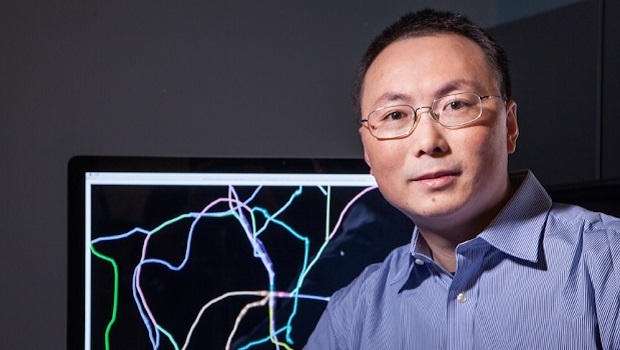 Hanchuan Peng: Neurons’ morphology information play central roles for understanding neurons’ firing patterns, wiring patterns, and other functions. But it is very hard, technically difficult, and time consuming to generate neuron reconstructions systematically that can well characterize the morphology information of neurons. It also lacks standards and widely applicable protocols in this field. Thus, if a technical platform and useful data resource could be produced via BigNeuron, it is going to play a central role for fast, large-scale phenotyping of the neurons’ basic shape properties, and thus will impact many areas of neuroscience as the basic building blocks of a nervous system will be better described, quantified, and thus better modeled and studied. New: What can the shape of a single neuron tell us? Peng: As mentioned above, the shape information tells us how the patterns of single neuron form, how a neuron develops, how the axon finds a target and form connection, and how the neuronal firing patterns are generated and regulated. Additionally, the shape indicates what the neurons’ network could look like and reveal the basis of the underlying genetic mechanisms that produce such shapes and neuronal connections. There are many profound reasons why the shape of neurons are crucial. Practically, we also need to catalog neurons’ shapes at large scale so we can better understand the cell types and other patterns in nervous systems. New: BigNeuron is described as an open community effort. How is the neuroscience community contributing to the project? Peng: We have received a large number of contributions from all over the world, including algorithms, computing time, datasets of many species, and financial sponsorships. These representative neuron datasets are for a variety of neuron image stacks from different species, including fruit fly and other insects, fish, turtle, chick, mouse, rat, and human, and nervous system regions such as cortical and subcortical areas, retina, and peripheral nervous system. These datasets also correspond to multiple light microscopy modalities, including laser scanning microscopy and brightfield or epi-fluorescent imaging. The neurons in consideration are labeled using different methods, such as genetic labeling and virus/dye/biocytin injection, and will span a broad range of types, including unipolar, multipolar, releasing different neurotransmitters, and with a wide variety of electrophysiological properties. We welcome more contributions from related fields and interested organizations/individuals. New: Given how valuable the goal of BigNeuron is—standardized methods of modeling individual neurons—why do you think the medical community has yet to tackle this problem? Peng: There are many reasons. One of them was that there was no appropriate technical platform that would make it relatively easy to port various neuron reconstructions together and thus bench test them. The platform we developed, called Vaa3D, is one of the most advanced and powerful software systems in the related fields. With this platform software, it makes it much easier to organize BigNeuron and set up all required technical studies. Another reason is that neuron reconstruction has increasingly been a central technique currently needed in various big neuroscience initiatives. New: Phase one of the project—a series of hackathons—has just kicked off. What is the timeline for the rest of the project, and what do future phases entail? Peng: The hackathons are only for people to get together to finish some final steps of the algorithm porting and data annotations and data analysis. These meetings are more visible, but BigNeuron has plenty of other activities. Indeed BigNeuron’s success heavily relies on data contribution and standardization, bench-testing of many ported algorithms, development and using the key technical infrastructure, and a huge amount of off-line discussions and communications of data scientists, to name a few. We plan to bench-test all ported algorithms against all contributed data from the summer of 2015, which will last a few months. Then we will spend a few months to half a year on data analysis. We hope we can finish the current edition of BigNeuron in the next one to one-and-a-half years, and release a database in the first half of 2016.